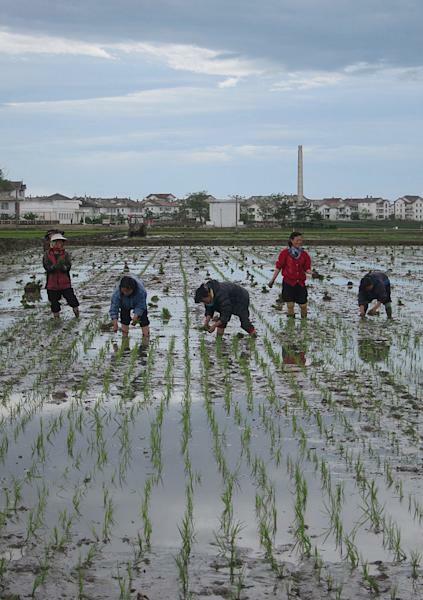 HAMHUNG, North Korea (AP) — North Korean farmers knee deep in muddy paddies across the country have a new incentive during this year's crucial rice planting season: possible bonuses that are part of an economic shift echoing ally China's steps three decades ago toward embracing capitalism. Details about the changes are emerging nearly two months after the regime unveiled dual goals of building the economy and nuclear weapons in the first concrete economic policy laid out by leader Kim Jong Un since he took power in December 2011. Farmers say they have begun working under the new policies, which are designed to boost production by giving managers and workers financial incentives. Foreign analysts say the moves to spur North Korea's moribund economy suggest Pyongyang is taking cues from Beijing on how to incorporate free market ideas within its rigid socialist system. The North's policy enshrining its provocative push to build atomic weapons as a national goal has complicated efforts to force North Korea to abandon its nuclear program and dominated international discussion about the country. Pyongyang's economic priorities have drawn far less attention but some experts think important reforms could be unfolding. 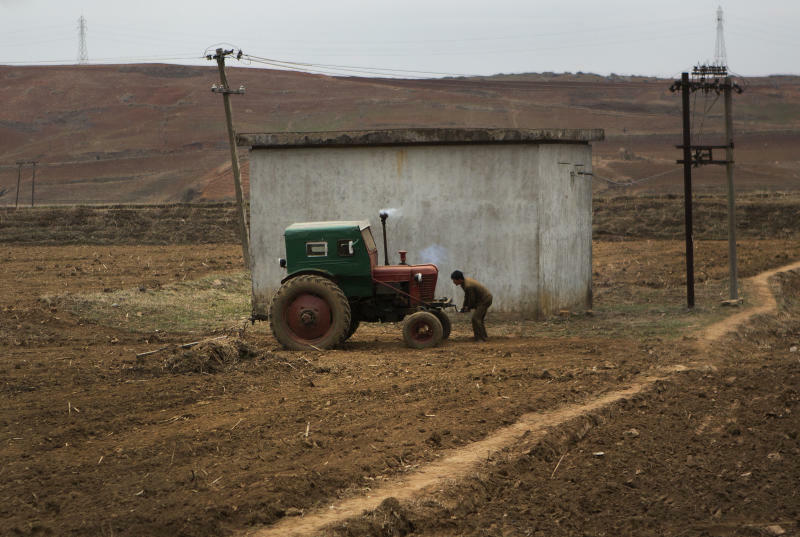 Impoverished North Korea suffers chronic food and power shortages and has not released economic data for decades. South Korea's central bank estimates the North's gross national income, an indicator of the average standard of living, was $1,250 per person in 2011 compared with $23,400 in South Korea. In the past, the North Korean state set workers' salaries. Under new measures announced April 1, the managers of farms, factories and other enterprises have been given leeway to set salaries and offer raises to workers who help drive up production. "This is definitely significant," said John Delury, an assistant professor of Chinese studies at Yonsei University in Seoul, South Korea. Providing material incentives and loosening central control over economic decision making are two key elements in the transition from a command economy to a market-based system, he said. Also announced April 1: the reappointment of Pak Pong Ju as premier after his dismissal from the post in 2007. Pak was central to attempts at economic change more than a decade ago. "You just wouldn't bring back Pak Pong Ju unless you were going to try readjusting economy policy. There would be no reason to do that," said Delury, calling it a strong sign of Kim Jong Un's interest in lifting living standards. North Korea's policy changes find an echo in China's market reforms that have transformed it into a manufacturing powerhouse and the world's second-largest economy while also lifting several hundred million out of grinding poverty. Beijing dismantled its centrally planned economy slowly. In the 1970s, it began allowing farmers to keep more of their harvests, giving them an incentive to grow more to sell on newly permitted free markets. Food production soared. In the mid-'80s, the government gave state enterprises the authority to link bonuses and salaries to better performance. Those changes were mostly aimed at managers, but they cracked a communist-era preference for egalitarianism. New rules in the early 1990s gave state enterprises full flexibility to set wages, widening the use of performance incentives. In that decade, China truly broke away from its centralized "iron rice bowl" system of guaranteed employment and state-set incomes. Delury and others cautioned that if North Korea is intent on economic reform, it is likely to be a fitful process. "We have to be careful not to say: Aha, it's all change, it's finally here," he said. "The point is, and we see this from the Chinese case, this is a process that unfolds over time and there are starts and stops, too. But this is a strong signal of a push." The Associated Press reported last September that farmers were notified of upcoming management changes at collective farms that would put decision-making and responsibility for crops in the hands of local officials and give farmers the right to hold onto surpluses. "Last year, we studied reasonable economic management methods in different fields of economic work, and introduced it to some units on a trial basis," Ri Ki Song, an economist from North Korea's Academy of Social Sciences, told AP this week. North Korea formally announced the policy, and its expansion to include factories and other enterprises, a day after holding a plenary session of the Central Committee of the Workers' Party. Rodong Sinmun, the party newspaper, called it part of a "new strategic line." Ri, however, dismissed characterizations of the changes as reform. What's new, he said, is allowing managers to dole out goods and cash as incentives. In addition, after paying back investments provided by the state, managers can set their employees' salaries and offer raises to those who help drive up production, he said. The main goal: to encourage "greater profits" and solve North Korea's chronic food shortage, Ri said. He said North Koreans work hard, but the new incentives give them motivation to work even harder. "They are saying that higher salaries and shares will improve their life." Political and military expert Ralph Cossa, president of the Pacific Forum CSIS in Hawaii, noted that North Korea has rolled back past attempts at economic reform. "The North Koreans have played reform games before and then just sort of pulled the rug out from under it," he said. Cossa cited international aid groups as saying the military is pressuring farmers to donate their portion to the army. Last year, a farmer's wife in Sariwon, south of Pyongyang, told the AP she planned to donate any surplus harvest to the state as a token of her patriotism. 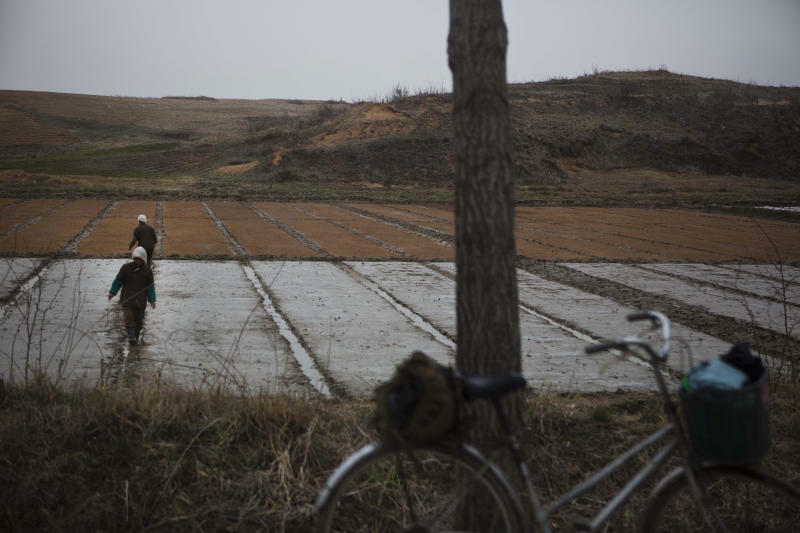 At the Tongbong farm in the eastern city of Hamhung, farmers are in the midst of a busy rice planting season after a long, cold winter. This year, things are being managed differently, said Kim Jong Jin, deputy chairman of the farm's managing committee. He said the state provided the farm with the rice seedlings, which farmers are now transplanting to paddies by hand. Farmers are on smaller teams that have direct responsibility over their plots. After the rice is harvested, farmers must "repay" the state for the seeds. At Tongbong that means giving the state about 193 kilograms of rice as payback for every 140 kilograms of seedlings they received. But any surplus can be kept by the team to sell, barter or distribute — a change from past policies that required farmers to turn all harvests over to the state. "This encourages enthusiasm for production and we get more of what's produced," Kim said. Associated Press writers Jean H. Lee, Foster Klug and Sam Kim in Seoul, South Korea; Kwang Hyon Kim in Pyongyang, North Korea; Charles Hutzler in Beijing; and Margie Mason in Jakarta, Indonesia, contributed to this report. Follow AP's Korea bureau chief, Jean H. Lee, at www.twitter.com/newsjean. Iranian President Hassan Rouhani says floods revealed 'vicious' nature of U.S.